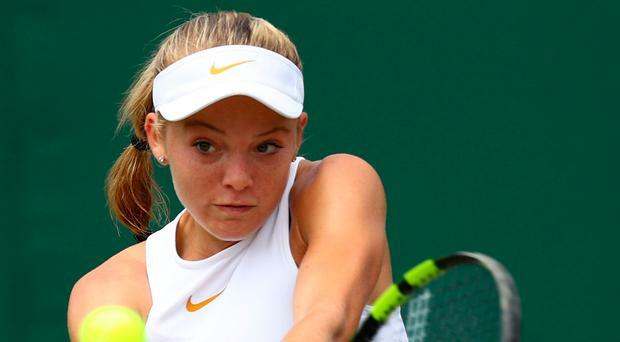 Katie Swan will leave Wimbledon feeling that she is not far away from the world's top players despite a heavy defeat in the second round. The 19-year-old produced the performance of the day on Monday from a British perspective to beat Irina-Camelia Begu but found a second Romanian in Mihaela Buzarnescu a different prospect altogether. Buzarnescu is seeded 29th but is in the top 16 on 2018 results after a remarkable rise, little more than a year after she thought injuries had wrecked her career. She was ruthless in the first set against Swan, who did not get on the board until the opening game of the second set, and the Romanian eventually came through 6-0 6-3. Swan later teamed up with Katie Boulter in a first-round doubles loss against 14th seeds Lucie Hradecka and Hsieh Su-wei, with Boulter due to play 18th seed Naomi Osaka in the second round of the singles today. Asked what advice she would give her partner, Swan said: "I played a really tough opponent so it was difficult. It was really nice to be on Court Three and have all the support behind me. "Katie is playing a great player and she's got no pressure. I'd say just go out and enjoy it and swing freely. At the same time go in with the belief that you can win, because I don't think we're too far off these girls. We are gaining experience all the time. You never know." Swan did not play badly in the opening set and came close to winning several games but Buzarnescu, the highest-ranked opponent the British youngster has ever faced, gave very little away while pinning her opponent in the corners and sending dust from the lines flying. Buzarnescu's level dropped in the second set and, had Swan won another game after fighting back from 1-4 to 3-4, the outcome might have been different. Bristolian Swan said: "I felt nerves going out there, which I think is a good thing, because it meant I cared. Even after winning my first match, I wanted to keep going in the tournament. "Unfortunately I didn't play my best. But I have to give credit to her because she really didn't give anything to me." Swan made her Wimbledon debut two years ago before injuries stalled her progress but she has taken a big step forward this season. The first-round victory will see her break into the world's top 200. The teenager believes experience of playing at this level is key to making further jumps. She said: "Practising here last week, I was playing every day with top 100, top 50 players, and I haven't had that for the last year. And I think every day I have improved and every day I'm getting more confidence that I can compete at this level. "The scoreline suggests that it was easy, but I did feel that there are some positives to take. I think the biggest thing is the consistency. That's what I'll be working on when I go home."